In the Navratri festival, devotees worship Goddess Saraswati and perform Saraswati Puja after worshipping Goddess Katyayani on the sixth day of Navratri. As per the Hindu beliefs, Goddess Saraswati symbolizes another form of Goddess Durga. Goddess Saraswati is spoken to as an elegant lady in white, an image of virtue and peace. She is the Goddess of information, learning, expressions and culture. She is viewed as the quiet Goddess wearing a sickle Moon on her temples riding a swan or situated on a lotus bloom. ‘Saraswati’ is another form of Maa Durga who is worshipped by the devotees during the festival of Navratri. The story of Goddess Saraswati is extremely significant in the Hindu Mythology as it is believed that without Goddess Saraswati, life, the way it is today, would not have been possible. After the creation of the universe, Lord Brahma felt that there is some instability and the Universe needs a strong foundation. To support the task of creation, Lord Brahma decided to create the epitome of wisdom and knowledge. 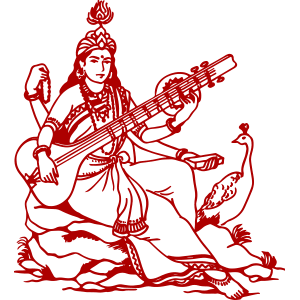 So, Goddess Saraswati emerged from his mouth as the deity of learning, knowledge, and wisdom. Goddess Saraswati then began to offer adequate direction to Lord Brahma regarding bringing order in stars, moon, sun, and cosmos. Later she became the consort of Lord Brahma. As per the Hindu scriptures, it is believed that devotees worship Goddess Saraswati as the deity of wisdom, art, science, knowledge, and music. Devotees worship Maa Saraswati by performing Saraswati Puja, chanting Saraswati Mantra and visiting the temples of the Goddess. Goddess Saraswati manifests creative energy and it is believed that those who worship her are bestowed with knowledge and creativity. Saraswati Puja is performed and Saraswati Stotrams are recited by students to seek her blessings and to succeed in their studies and other academic endeavors. See also: Saraswati Mata Aarti. As per the Hindu Mythology and Shiva Maha Purana, there are various mythological stories which are associated with the appearance of Goddess Saraswati. According to ancient legends and Hindu scriptures, the demons and the deities decided to churn the ocean to get Amrit (elixir of life). It is believed that it was Goddess Saraswati who found "Amrit" in the Himalayas and gave it to the divine beings.